If you’ve never been to a small country fair, you should go. For those of you who live in the city, you know how every once in a while there’ll be carnival rides in some old parking lot in your city? It’s like that, except with the addition of things like 4H animal shows, auctions, and nightly events like car races, smash up derbies, horse pulls, etc. When I was a kid we went to the Alcona County fair, and it was wonderful. Last thursday we took the girls to the Manistee county fair with my in-laws and my wife’s grandma. Except for the layout, it was pretty much identical to all the fairs I went to as a kid. It was heavenly. The first impression you get the smells. Hot fried food, sausages, hot sugar from the cotton candy and carmel corn, barnyard smells from the animals, etc. Then the sounds; music from every different ride, people yelling for us to come play their games, kids screaming on the rides, etc. It’s a giant party, and everyone’s having a great time. The girls wanted to ride rides right away, so we bought them some all-you-can-ride bracelets. $12 gets you all the rides you can handle, all night. The rode the race cars first. They were kind of slow on the straightaway, but spun out on the corners, and Sophi was REALLY surprised the first time. They had a blast on them though. Then we went down to the barns to look at the animals. My in-laws knew some folks that had entered animals. The auction was in mid-swing though, so we didn’t stay in the main barn too long. For those unfamilair with country culture, kids in 4H or FFA (Future Farmers of America) spend the year raising an animal or two. It can be almost anything, rabbits, chickens, goats, pigs, sheep, cows, etc. Then at the fair they "show" them, and get awards for size, health, etc. Then they auction them, and the kids get the cash. A good size cow or pig can go for hundreds of dollars, and many kids will do several animals to save money for college. After the barns, I got a bracelet too, so I could ride with Molly on some bigger rides. Sophi wasn’t interested in "fast" rides. Molly and I went on The Paratrooper while Sophi went back and rode some of the smaller rides. After that we got some food and headed to the Horse Pull. I got an Elephant Ear, and an Italian Sausage. They cook the sausage in a long coil right on the grill, and then cut off a chunk and put it in bread. Cate got some fresh squeezed lemonade, and the girls got a big bag of cotton candy. 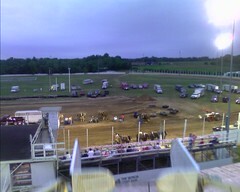 I’d been to tractor pulls before, but never a horse pull. The horse pull is a LOT quieter, I’ll tell you that. In fact, if you talk in the stands, people shush you, because you can spook the horses. They have a small sled that they put 500lb concrete blocks on. Each team of horses tries pulling it, and then they increase the weight. The last team to be able to pull it wins. We watched until almost the end, and teams were pulling several tons. Some were getting only feet, and some only inches, but the last ones we watched pulled (I think) 3 tons the full 25 feet. There’s also an interesting culture around the horse pullers. Most know each other, and owners have reputations for how they handle their horses, and you can see it in the horses. Some owners get their horses to pull out of fear and pain. It works, they pull, but they’re very skittish and hard t work with. Some train with calmness, and the horses stand nicely until it’s time to go. Oddly, they pull just as well as the ones used to getting electrical shocks in their sensitive spots. Cate and her dad watched almost the entire horse pull while the girls and Kathy and I went out to ride things. Molly and I rode The Scrambler, one of my favorite rides. She LOVED it. Sophi stood outside looking through the bars looking SO SAD. She was too short to ride. Afterwards I asked her if she was sad and she said "No, I don’t like fast rides." Then Molly and I rode the Ferris Wheel, and then what Molly called "The axe ride". It took me a while, but she meant the giant pirate boat the swings back and forth. She thought it looked like an axe. It started to rain just as we were getting on, so The Man paused to put plastic bags over the speakers. During the ride Molly had that expression on her face that kids get when they’re experienceing something with all their senses. She sat very still, and her eyes just kind of wandered. She was listening, feeling, watching; all of it. After that we stopped by a little fishing pool. Everyone’s a winner. For $5 you "win" something from a smaller tub, and for $10 you "win" something stuffed from up above. The girls dropped their hooks into the small swmiming pool and oddly enough each hooked a shark! That’s all there was. 🙂 So they each picked a toy samurai sword, and carried them around the rest of the evening. They were both getting pretty tired by this point. Molly and Grandma went back to the horse pull, and Sophi I went on the ferris wheel. Being tired, she stood very quietly, waiting patiently. I held her for a little while, and she put her head on my shoulder. It was still raining, and getting a little chilly. When we got on, there was quite a line, and so they stopped it every couple minutes to let people on. We got stopped at the top quite a few times, and got to wave at Grandma and Molly sitting at the top of the grandstands. Sophi was having a ball, and I was Super Daddy. I’d also like to point out that I was sick. Very very sick. And I was sitting in the top of the ferris wheel in the rain and cold wind wearing just a tshirt and shorts. It’s almost a week later as I write this, and it’s my first day back to work, and I’m still not all better. Was it worth it? So SO worth it. Every last second. Everyone had a great time, and the girls are going to remember it for the rest of their lives. I have a good set of pictures here. I grew up in a small town, and the county fair was in our town every year. Lots of fun memories! My wife took our kids to a fair on Saturday. I gather that they had a good time. It’s a fun experience for the kids. Our kids enter stuff in the fair every year – arts, crafts, baking, etc. This year our three girls (9-13) took 1st, 2nd, and 3rd in the Hershey’s baking contest. We’ve even been able to sing and play Gospel bluegrass as a family on the stage. Only at a county fair! It’s there that you run into ol’ friends and eat things you normally wouldn’t anytime eles. It’s made some great memories. We look forward to it every year and the kids spend quite a bit of time preparing. It’s a part of the culture here in the north woods of Minnesota.